A mere 100 years since the founding of the Congregation, and 45 years after the sons of St. Alphonsus established their first community outside their native Italy, six Redemptorist pioneers set foot in New York City on this date in 1832. Fathers Simon Saenderl, Francis X. Haetscher, Francis X. Tschenhens, and Brothers Wenceslaus Witopil, Aloysius Schuh and James Kohler were the first of many Redemptorists who came to America to serve the needs of the poor and most abandoned, especially newly arrived immigrants. The likes of St. John Neumann and Blessed Francis X. Seelos would quickly follow in their footsteps. We are ready to go to any corner of the world. And none of us will live to draw down upon himself the disgrace of being numbere among the builders of a tower who lay the foundation but are unable to complete their undertaking. 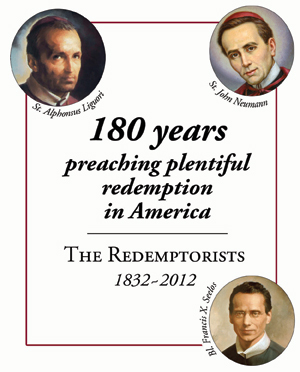 Today we give thanks to God for the missionary zeal and courage of these first Redemptorist pioneers, and pray for the blessing of many more years of proclaiming plentiful redemption on these shores.